Stanley Ann Dunham was the mother of Barack Obama, the 44th President of the United States, and an American anthropologist who specialized in economic anthropology and rural development. 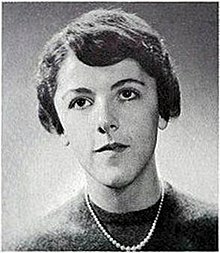 Dunham was known as Stanley Ann Dunham through high school, then as Ann Dunham, Ann Obama, Ann Soetoro, Ann Sutoro , and finally as Ann Dunham. Born in Wichita, Kansas, Dunham spent her childhood in California, Oklahoma, Texas and Kansas, her teenage years in Mercer Island, Washington, and most of her adult life in Hawaii and Indonesia. Stanley Ann Dunham (November 29, 1942 – November 7, 1995) was the mother of Barack Obama, the 44th President of the United States, and an American anthropologist who specialized in economic anthropology and rural development. Dunham was known as Stanley Ann Dunham through high school, then as Ann Dunham, Ann Obama, Ann Soetoro, Ann Sutoro (after her second divorce), and finally as Ann Dunham. Born in Wichita, Kansas, Dunham spent her childhood in California, Oklahoma, Texas and Kansas, her teenage years in Mercer Island, Washington, and most of her adult life in Hawaii and Indonesia. Dunham studied at the East–West Center and at the University of Hawaii at Manoa in Honolulu, where she attained a bachelor's of anthropology and master's and PhD in anthropology. She also attended University of Washington at Seattle in 1961–1962. Interested in craftsmanship, weaving and the role of women in cottage industries, Dunham's research focused on women's work on the island of Java and blacksmithing in Indonesia. To address the problem of poverty in rural villages, she created microcredit programs while working as a consultant for the United States Agency for International Development. Dunham was also employed by the Ford Foundation in Jakarta and she consulted with the Asian Development Bank in Gujranwala, Pakistan. Towards the latter part of her life, she worked with Bank Rakyat Indonesia, where she helped apply her research to the largest microfinance program in the world. After her son was elected President, interest renewed in Dunham's work: The University of Hawaii held a symposium about her research; an exhibition of Dunham's Indonesian batik textile collection toured the United States; and in December 2009, Duke University Press published Surviving against the Odds: Village Industry in Indonesia, a book based on Dunham's original 1992 dissertation. Janny Scott, an author and former New York Times reporter, published a biography about Ann Dunham's life titled A Singular Woman in 2011. Posthumous interest has also led to the creation of The Ann Dunham Soetoro Endowment in the Anthropology Department at the University of Hawaiʻi at Mānoa, as well as the Ann Dunham Soetoro Graduate Fellowships, intended to fund students associated with the East–West Center (EWC) in Honolulu, Hawaii. In an interview, Barack Obama referred to his mother as "the dominant figure in my formative years ... The values she taught me continue to be my touchstone when it comes to how I go about the world of politics."